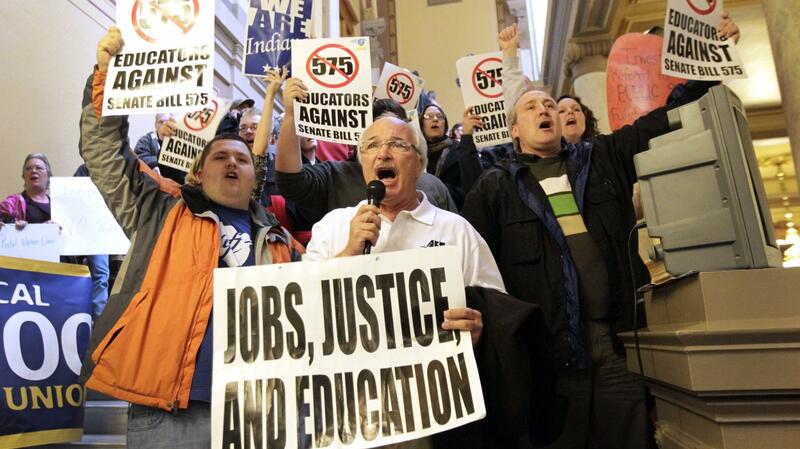 Rick Muir, president of the Indiana Federation of Teachers, chanted with other protesters at the Statehouse in Indianapolis in February 2011 over legislation limiting collective bargaining for teachers. Months later, it became law. "It's a bellwether for sure," says labor studies professor Marquita Walker of Indiana University-Purdue University, Indianapolis, who joined the ranks of those who fought against an Indiana right-to-work law supported by Gov. Mitch Daniels. Indiana is among nearly two dozen states that have passed similar laws. Daniels wiped out collective bargaining for state employees by executive order in 2005 just six years after his predecessor, Democrat Evan Bayh, had created them — also by executive order. Brett Voorhies, president of the Central Indiana Labor Council, told The Indianapolis Star on Wednesday that Wisconsin could prompt local governments to eliminate collective bargaining for teachers and firefighters. "There will be other dominoes; other states will fall," says Walker, who is no relation to the Wisconsin governor. The 2010 elections realigned legislatures in several Midwestern states as Republicans gained seats. That gives the Wisconsin vote more punch, says Lee Adler, a public sector union expert and professor at Cornell University. "This could have a negative impact on the power and strength of the labor movement," he says. Alaine Williams, an attorney who represents public employee unions in Pennsylvania and Delaware, agrees, saying, "I worry that this will embolden those who desire to diminish the role of unions." Republicans — who far outspent Democrats and pro-union forces backing Democratic challenger Tom Barrett — relished Walker's victory and sounded a note that seemed to play to labor's fears. "I don't think we can get pushed around anymore by Big Labor," Republican National Committee Chairman Reince Priebus told Politico. Unions have lost some of their clout, not to mention dues-paying members, in states such as Wisconsin and Indiana that have passed right-to-work laws. Those laws require that employees be allowed to work without joining a union or paying dues or fees. Similar legislation is being considered in Missouri and in Ohio, despite the fact that Ohio voters repealed a law limiting collective bargaining last year. Not everyone thinks the Wisconsin vote is gloom and doom for organized labor. Bob Bruno, a professor of labor and employment relations at the University of Illinois, thinks few governors have a taste for the kind of all-out confrontation that Walker incited by curbing collective bargaining rights. That sparked off a months-long protest that drew tens of thousands of protesters to jam the state Capitol and culminated in the recall vote. "Probably governors will look at the whole battle and conclude that there's a better way of making the kind of changes that they want to make than setting off this kind of political challenge," Bruno says. "I imagine you will find governors being a bit more strategic in their approach to these sorts of things." In pushing to oust Walker, labor joined forces with nontraditional allies — something Bruno says could prove valuable in future confrontations. "Labor was not really at the forefront as much as were students, the community, farmers' groups," he says. "This could bear significant fruit in the November elections and beyond. Labor has learned that the nonunion community is something it can build alliances and relationships with." But Adler says anti-union momentum is building among state and local governments because of the U.S. economic crisis, which has left many of them with gaping holes in their budgets. Wresting power from the unions could make it easier for them to cut payrolls and worker benefits. "Revenues have dried up so substantially that almost every municipal government in the United States is having difficulties," he says.